Compassionate care is an integral part of patient care and is fundamental to Bradenton Urology’s philosophy. We designed the website to promote their outstanding service to their patients. The layout of the homepage allows patients to find information easily. The featured services section promote specialties from the urology professionals. In addition, the doctors are well recognized on the homepage with the special awards they have received. The home page is very succinct, encouraging visitors to either schedule an appointment right away or otherwise explore the site for additional information. We spotlight the two separate locations available for the convenience of patients, as well as the ‘new patient’ section that introduces visitors to Dr. Allen and offers the convenience of downloadable patient forms. For those searching for additional information, we integrated a comprehensive library of patient education, including explanations of the various services offered by Dr. Allen and his team. We also included information about the various types of conditions treated, from bladder and kidney cancer to incontinence and erectile dysfunction. Videos also help to provide additional information in a variable content format. 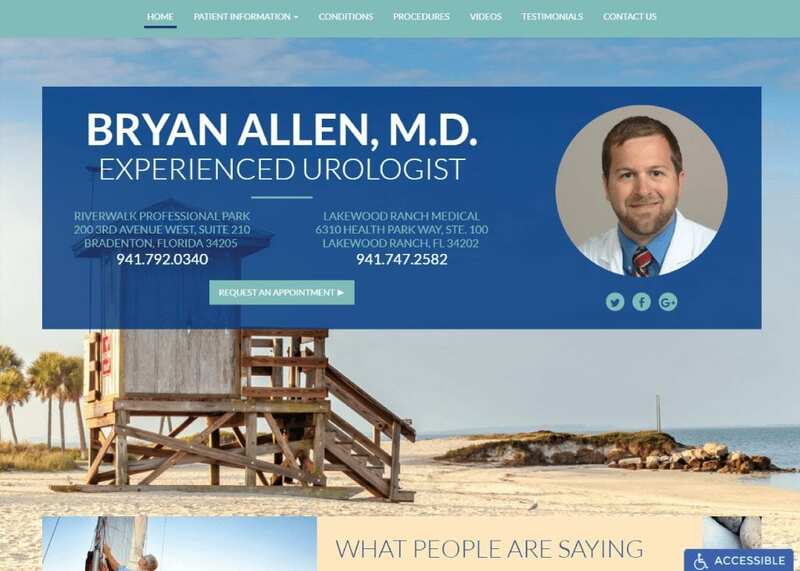 Dr. Allen also implements ADApt within his website to ensure that visitors get the most optimal web experience as possible – another example of going the extra mile by the urology experts! The colors for this website were chosen based on the geography of the area the practice serves. For this site, we chose various shades of ocean blue and sea green complemented by bright white and sandy beige. These colors compliment the images chosen for the website, which depict both water and sand. We implemented a white background to also insinuate a feeling of professionalism. Establishing trust upon your first impression can make or break a patient’s commitment to your practice! Web designs for urologists are often described as ‘serious’ or ‘plain’. At Optimized360, we believe a practice can be highly professional without being boring. Custom urology web designs stand out from the competition with design elements not available from template-based sites. For this site, we created a three-dimensional effect with scrolling images that set the background for text on the home page. We also created responsive buttons that change color when hovered over. The pictures on this website actually play a big role in the urology office marketing. Images of the beach and water appeal to local Florida residents who may more readily identify with a physician who seems to be familiar with the area and the people. We offer several opportunities to schedule an appointment and used the real-life testimonials of happy patients to tout the gentle care that Dr. Allen is so well-known for. For those hoping to stay connected with the office or simply find out more about special offers, we included links to the practice social media accounts at the top and bottom of the home page. In addition, users viewing the site on mobile devices can click on the phone numbers directly to contact the scheduling department. This custom urology website depicts images of calm and hope. For many visitors, they are searching for a physician who can provide them with an improved quality of life. Pictures of the beach and water foreshadow endless possibilities and may also help to reduce the anxiety new patients may feel about a first-time urology appointment.